This car is in current production. Definitive information on the manufacturers' site. The Fighter had been a twinkle in Bristol's eye for many years, but the cost of development required an injection of capital that was not to occur until Toby Silverton's acquisition in about 1997. 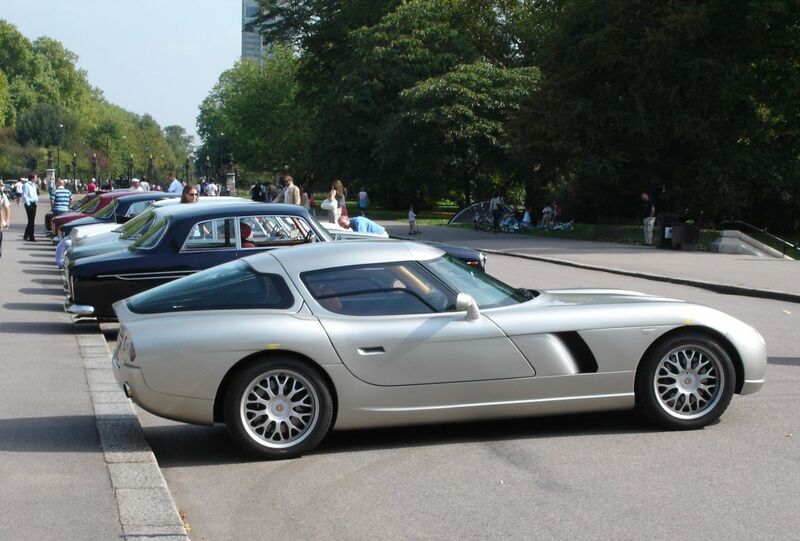 Perhaps surprisingly, Bristol Cars made no secret of the Fighter project, announcing it in 1999 and showing the first examples in 2003. It was certainly a surprise for the pundits. After all, Bristol had been refining the 603 for a quarter of a century, and hadn't produced a two-seater since the type 404 25 years before that. Less surprisingly to those who know the company and its cars, the thinking behind the Fighter was uncompromisingly different, reflecting more the design values of the 404 than those of other cars of similar performance. In particular, but in no particular order, these include: performance, handling, safety, efficiency, comfort and practicality. Conspicuously absent from the list is appearance or styling: from the outset, it was clear that the Fighter would be representing a thorough-going engineering approach to the design goals. Thus, the Fighter achieves its astonishingly low drag factor and its high-speed handling and stability not from fins or spoilers, but from the basic geometry of the body shell. If the result is aesthetically pleasing – and the Fighter is a good-looking car – it is because visual grace is the natural concomitant of aerodynamic perfection. The chassis, which is (as is traditional with Bristol) box-section steel, has a honeycomb aluminium floor. It was designed by Max Boxstrom, whose previous work includes the Aston Martin AMR1. The body is for the most part traditional hand-crafted aluminium, but the doors and tailgate are skinned in a carbon fibre composite. 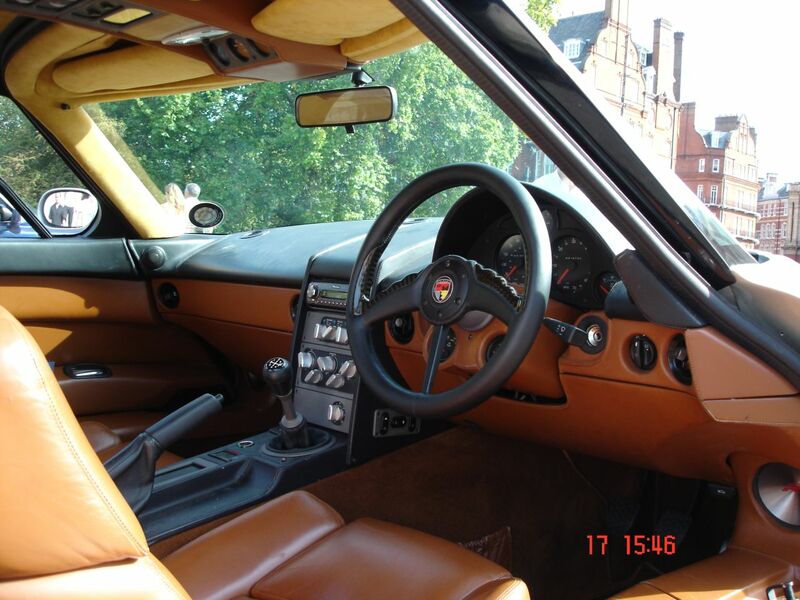 The interior boasts plenty of traditional leather, as can be seen from the photo below. 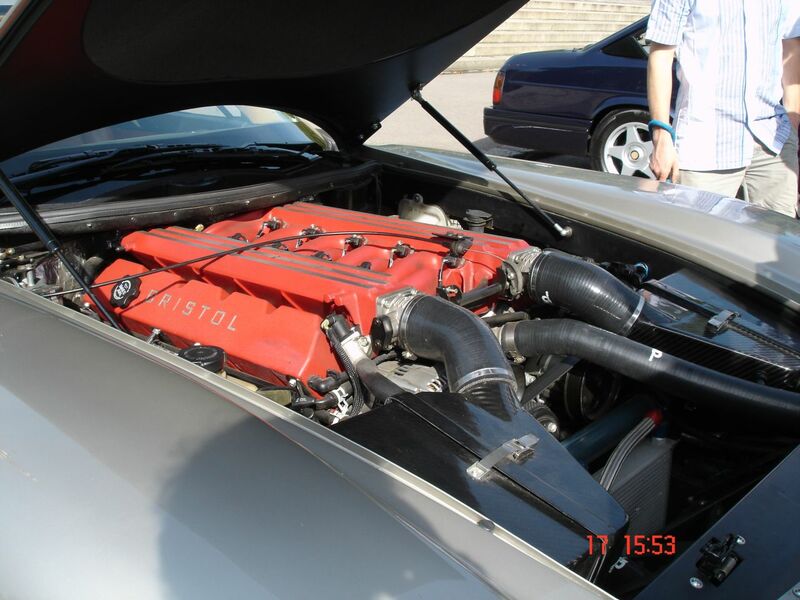 The engine is extremely tractable: on the standard model, torque is 350 lb. ft. at tickover. One of our members, who was lucky enough to be taken for a drive, attests that the Fighter will reach and hold 210 mph without drama. For the "S" version, 240 mph is claimed. The "T" version is theoretically capable of more than 270 mph, but is electronically limited to a “more than adequate” 225 mph at 4600 rpm. Accommodates people in the height range 4'11" to 6'7"